We have created a brochure which can be customized with your State Association’s logo, contact information, and colors. 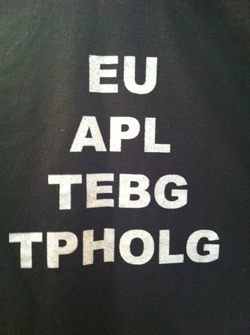 Our black I AM TECHNOLOGY t-shirts display steno on the front and English on the back. We also have a PowerPoint presentation to bring awareness to high school students of Realtime Reporting as a career choice. All of these items are included in our State Packages. With school enrollment declining and the threat of electronic recording, NOW is the time to tell people what we do! The t-shirts offer a wonderful fundraising opportunity for your association! We’ve done the work, you reap the rewards! We are especially encouraging states with Business Professionals of America (BPA) chapters to present to the BPA state leadership conferences. Business Professionals of America is the leading CTSO (Career and Technical Student Organization) for students pursuing careers in business management, office administration, information technology, and related fields. BPA has 43,000 members in over 2,300 chapters in 23 states! Alaska, Delaware, Florida, Idaho, Illinois, Indiana, Iowa, Kansas, Massachusetts, Michigan, Minnesota, Montana, New Mexico, Ohio, Oklahoma, Rhode Island, Texas, and Wisconsin all have BPA Associations. California, New York, New Jersey, Kentucky and South Carolina have independent chapters. Click to connect to your State’s BPA Association: http://www.bpa.org/about/saac. What a great way to market our profession to students who are already interested in business and technology! It is NCRA’s goal to “recruit more students into our profession.” This is an awesome opportunity for each state to do their part! If you are interested in a customized package for your school or state contact cfarmer@frontier.com.